The Jackson Academy community celebrated the launch of a revised mission statement and new language to express JA’s unique strengths and qualities January 15 and 16. 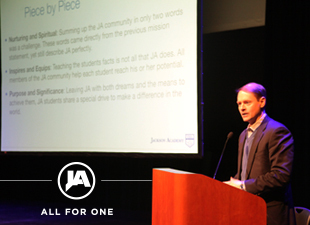 JA President Cliff Kling presented the revised statement of our enduring mission, developed through a careful, yearlong process of gathering input from the JA community by members of the Mission Statement Task Force. 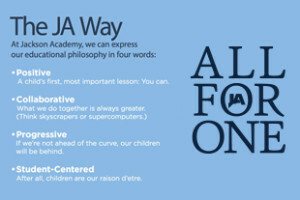 Click here to view the Mission Statement Presentation videoLisa Jordan from the Atlanta firm Mindpower, Inc. revealed the findings from her company’s work with JA’s students, parents, alumni, faculty, staff, and trustees to identify and communicate the qualities that make JA special. The presentation included The JA Way, a four-point statement that powerfully demonstrates the school’s positive, collaborative, progressive, and student-centered educational approach. 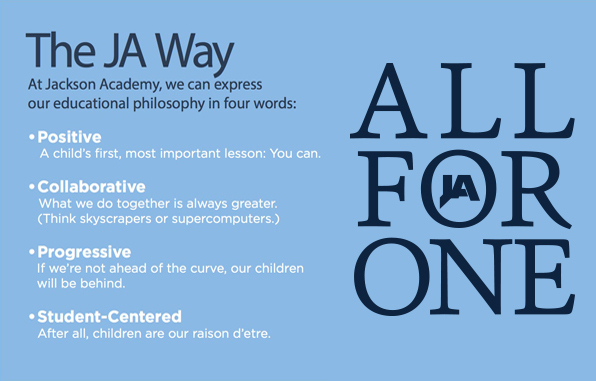 She also presented a brand statement that conveys the spirit of the school. 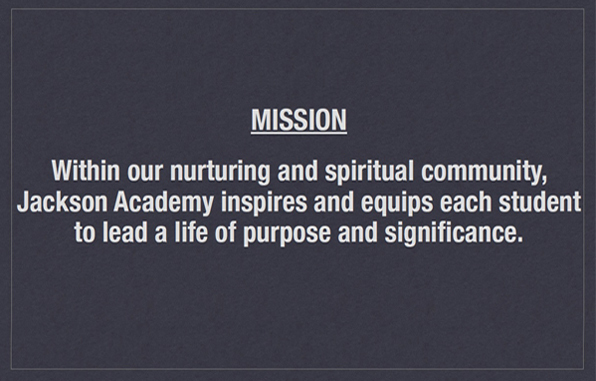 Click here to enlarge the image. Click here to enlarge the image. 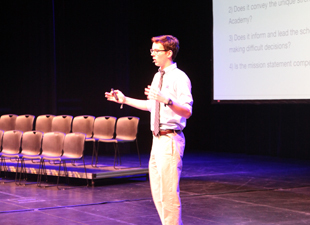 Senior Will Tribble, one of the student members of the Mission Statement Task Force, developed a presentation for Middle and Upper School students that he gave Friday. He discussed the task force’s rationale behind the revised wording, pointing out the traditional elements that were carried forward and the newer language and its intent. 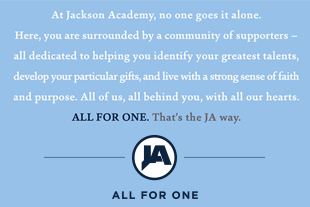 Jackson Academy is grateful to all the individuals who took part in the mission statement and the brand identity programs by participating in a survey, focus group, task force, or preparing for the three events. 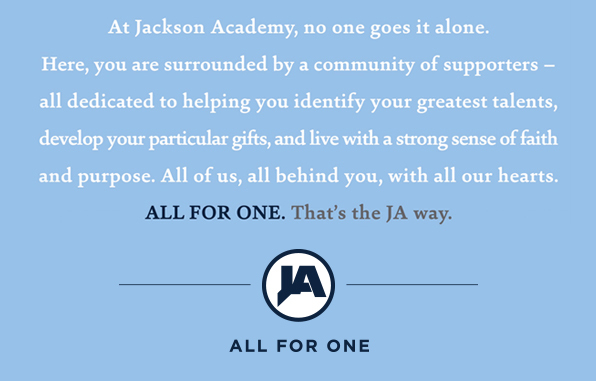 Thanks to the JA Jazz Band for providing music, the Student Council for providing childcare, and the JAA for organizing the Thursday reception. Special thanks also go to Trustee Vice-chair Ashley Willson, who moderated the Thursday evening program, and to seniors Wesley Rule and Eliza Lundy who provided invocations at the events. Visit jaband.blogspot.com to view the band photos of the event.